The Internet officially ended its bold and exciting run of relevancy, according to pop culture touchstone and 'Batdance' singer Prince. "The Internet's completely over," the 52-year-old recording artist told the UK's Daily Mirror. "The Internet's like MTV. At one time MTV was hip and suddenly it became outdated. Anyway, all these computers and digital gadgets are no good. They just fill your head with numbers and that can't be good for you." The bizarre interview is touted as Prince's first sit-down with a newspaper in 10 years. Writer Peter Willis was forbidden from bringing a recorder, camera or cell phone into Prince's Minneapolis recording studio/lair. "Prince decided the album will be released in CD format only in the Mirror," Willis writes. The star's 33rd studio release, '20TEN,' will be packaged free with the newspaper and other British and European dailies this weekend. "There'll be no downloads anywhere in the world because of his ongoing battles against Internet abuses. Unlike most other rock stars, he has banned YouTube and iTunes from using any of his music and has even closed down his own official website." What's Prince's take on the whole thing? "I don't see why I should give my new music to iTunes or anyone else. They won't pay me an advance for it and then they get angry when they can't get it." No word yet on American distribution for the unorthodox venture. 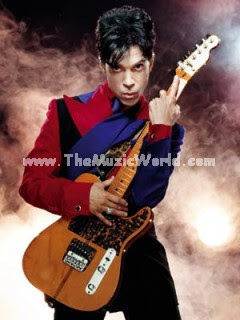 The writer, an unabashed Prince-o-phile, calls the album "instantly infectious," "a return to his early blistering form" and "amazing." And why '20TEN'? "I just think it's a year that really matters," Prince says. "These are very trying times. People, especially young people, don't have enough God in their lives." The mysterious Prince, whose name was once a symbol, was short about several questions. His childhood? "I don't talk about the past." Former rival Michael Jackson? "Next question."